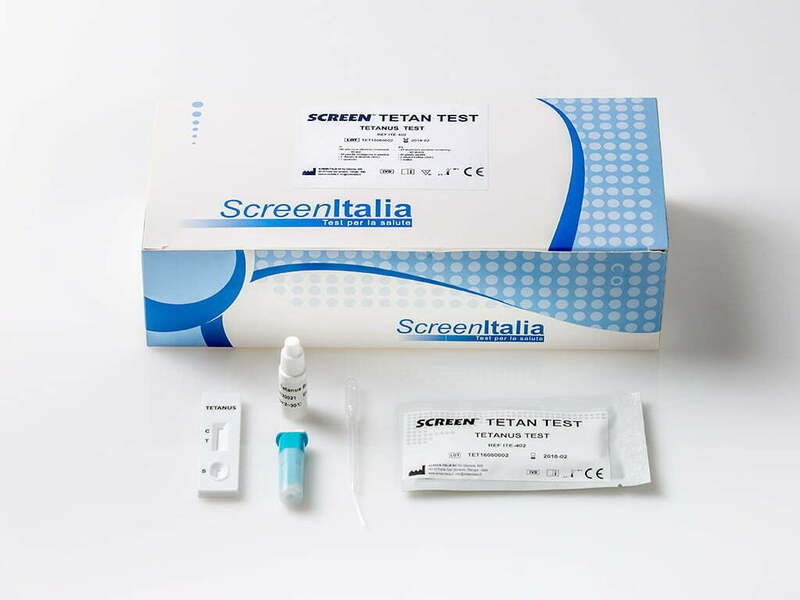 Tetanus Test is a rapid immunoassay for qualitative detection of tetanus antitoxin antibodies in serum, plasma, or whole blood samples. The assay is intended for helping anti-tetanus prophylaxis for patients at risk of tetanus. The assay uses an immunochromatographic technique, which uses an association of tetanus anatoxin bound on the membrane (test area (T)), anti-tetanus antibodies possibly present, and tetanus anatoxin bound to colloidal gold particles. During migration of a positive sample, anti-tetanus antibodies are firstly caught by the anatoxin bound to the particles. Under the influence of the diluent, this complex migrates along the membrane, then is secondly immobilised by the anatoxin bound to the test area (T), producing a pink test line. Presence of an internal control line in the control are (C) indicates the test correctly works.